Editor’s note: Some of you asked us to write a tutorial about audio recording. This week, we work with Yiqi Shi and Raymond from Purple Development to give you an introduction of AVFoundation framework. Yiqi and Raymond are independent iOS developers and have recently released Voice Memo Wifi that allows users to record voice memo and share it over WiFi. 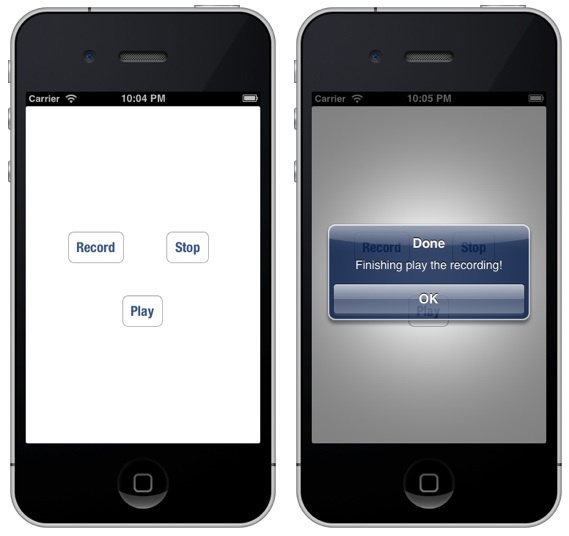 iOS provides various framework to let you work with sound in your app. One of the frameworks that you can use to play and record audio file is the AV Foundation Framework. In this tutorial, I’ll walk you through the basics of the framework and show you how to manage audio playback, as well as, recording. To provide you with a working example, I’ll build a simple audio app that allows users to record and play audio. Our primary focus is to demonstrate the AV Foundation framework so the user interface of the app is very simple. AVAudioPlayer – think of it as an audio player for playing sound files. By using the player, you can play sounds of any duration and in any audio format available in iOS. First of all, create a “Single View Application” and name it as “AudioDemo”. To free you from setting up the user interface and code skeleton, you can download the project template from here. I’ve created a simple UI for you that it only contains three buttons including “Record”, “Stop” and “Play”. The buttons are also linked up with the code. 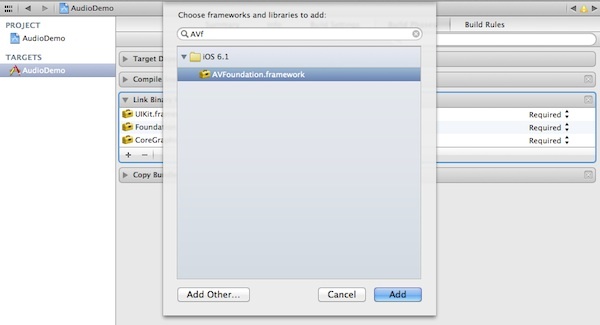 By default, the AVFoundation framework is not bundled in any Xcode project. So you have to add it manually. In the Project Navigator, select the “AudioDemo” project. In the Content Area, select “AudioDemo” under Targets and click “Build Phases”. Expand “Link Binary with Libraries” and click the “+” button to add the “AVFoundation.framework”. To use the AVAudioPlayer and AVAudioRecorder class, we need to import in ViewController.h. First, let’s take a look how we can use AVAudioRecorder to record audio. Add the AVAudioRecorderDelegate protocol and AVAudioPlayerDelegate in the ViewController.h. We’ll explain both delegates as we walk through the code. Specify a sound file URL. Set up the audio session. Configure the audio recorder’s initial state. 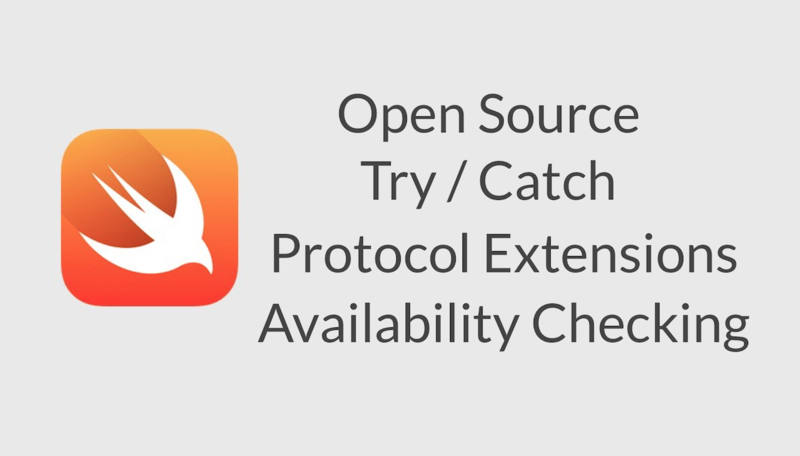 Note: For demo purpose, we skip the error handling. In real app, don’t forget to include proper error handling. In the above code, we first define the sound file URL for saving the recording. and then configure the audio session. iOS handles audio behaviour of an app by using audio sessions. Upon launch, your app automatically gets an audio session. You can grab such session by calling [AVAudioSession sharedInstance] and configure it. Here, we tell iOS that the app uses “AVAudioSessionCategoryPlayAndRecord” category which enables both audio input and output. We will not go into the details of audio session but you can check out the official document for further details. The AVAudioRecorder uses a dictionary-based settings for its configuration. In line 21-25, we use the options keys to configure the audio data format, sample rate and number of channels. Lastly, we initiate the audio recorder by calling “prepareToRecord:” method. Note: For other settings keys, you can refer to AV Foundation Audio Settings Constants. We’ve completed the audio preparation. Let’s move on to implement the action method of Record button. Before we dive into the code, let me explain how the “Record” button works. When user taps the “Record” button, the app will start recording and the button text will be changed to “Pause”. If user taps the “Pause” button, the app will pause the audio recording till the “Record” is tapped again. The audio recording will only be stopped when user taps the “Stop” button. In the above code, we first check whether the audio player is playing. If audio player is playing, we simply stop it by using the “stop:” method. Line 7 of the above code determines if the app is in recording mode. 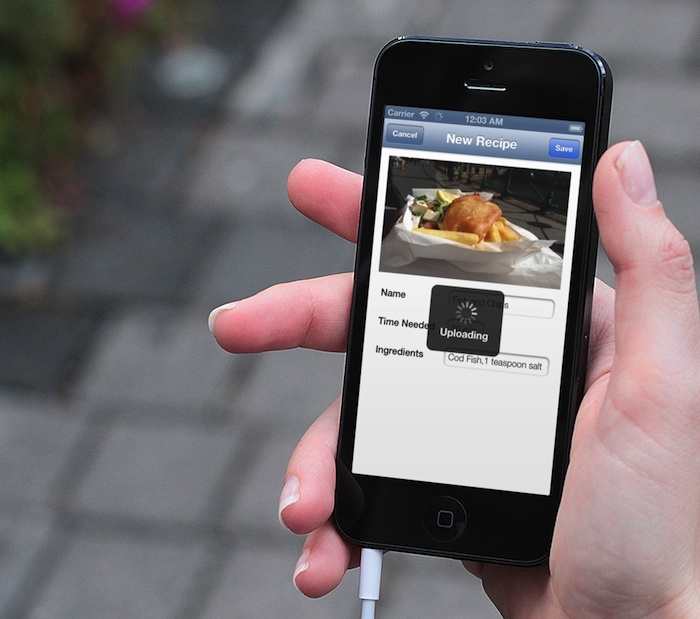 If it’s not in recording mode, the app activates the audio sessions and starts the recording. For recording to work (or sound to play), your audio session must be active. After finishing the recording, we simply change the “Pause” button back to “Record” button. Initialize the audio play and Assign a sound file to it. In the case, it’s the audio file of the recording (i.e. recorder.url). Designate an audio player delegate object, which handles interruptions as well as the playback-completed event. Call play: method to play the sound file. The delegate of an AVAudioPlayer object must adopt the AVAudioPlayerDelegate protocol. In this case, it’s the ViewController. The delegate allows you to handle interruptions, audio decoding errors and update the user interface when an audio has finished playing. All methods in AVAudioplayerDelegate protocol are optional, however. To demonstrate how it works, we’ll implement the “audioPlayerDidFinishPlaying:” method to display an alert prompt after the completion of audio playback. For usage of other methods, you can refer to the official documentation of AUAudioPlayerDelegate protocol. UIAlertView *alert = [[UIAlertView alloc] initWithTitle: @"Done"
message: @"Finish playing the recording!" You can test audio recording and playback using a physical device or software simulator. 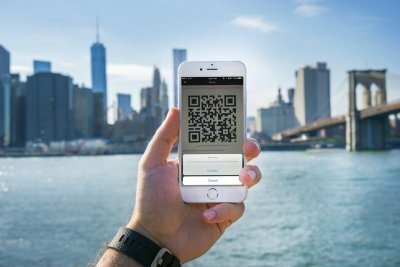 If you test the app using actual device (e.g. iPhone), the audio being recorded comes from the device connected by the built-in microphone or headset microphone. On the other hand, if you test the app by using the Simulator, the audio comes from the system’s default audio input device as set in the System Preference. So go ahead to compile and run the app! Tap “Record” button to start recording. Say something, tap the “Stop” button and then select the “Play” button to listen the playback. For your reference, you can download the complete source code from here. Feel free to leave me comment if you have any questions. This post is contributed by Yiqi Shi and Raymond from Purple Development. Yiqi and Raymond are independent iOS developers and have recently released Voice Memo Wifi that allows users to record voice memo and share it over WiFi. Great tutorial – very helpful! Thanks for simon ng, Thanks for Raymond. Thanks to the always helpful. I would like a tutorial how external sound, music, singing, talking etc can trigger an action, animation, image etc. Thanks for the great turorials btw, youre doing a great job! How can I save my recorded audio? Why does playing sound not require Audio Session ? I am using XCode 4.2, IOS 5, MacOS 10.6.8. Do you have source code for the above combination please? go to “Show the File inspector” check autolayout isn’t ticked. How the user will be able to attach the additional recording to the beginning, overlay in the middle or append to the end of the original audio recording.? Do you know why and how to fix it? Never mind. I`ve already did it. Is there a way to modify this code so that instead of recording audio using the microphone (hardware), the record button records sounds that the phone is making/outputting? I have programmed a few buttons to make noises, and I want to be able to record a sequence of those noises and play back that recording. I am running this code in iOS 7, it is not working. May i know how to record and set framerate to some xxfps(eg:24fps).? Thanks in advance. All parameters which receive an NSError pointer, such as [session setCategory:AVAudioSessionCategoryPlayAndRecord error:nil] have not been properly handling. If an error were to ever occur, you’d have no idea what happened and your application will not work properly (might even crash depending on what you’re trying to do). How would i use metering(measuring the level of audio input)? I have a TableView Contains List of Urls and When i did selectRow In the next view AVPlayer should Play,Pause etc…. Very useful tutorial. Can you please please please do one using Swift language? What would i need to do if i wanted to have two buttons to record separate recordings? 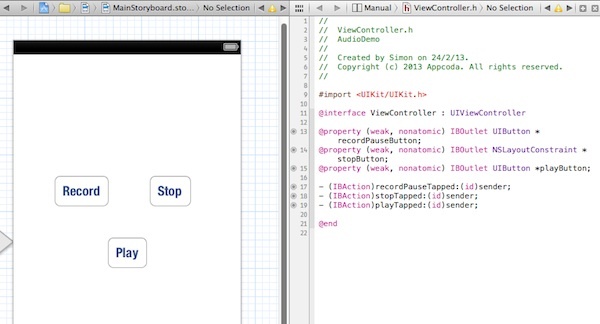 u have put that code link, but its empty buttons there oin xcode project…. How can I test the latency of the record audio? Got this working perfectly, but i just wondered how i can set it up so that incoming text message notifications are not muted when recording? can we test in simulator ? when attempting to instantiate the AVAudioRecorder; I am not passing optional values. i make a karaoke app. it is recording success (background mp3 and my voice mix) when headphone was not plugin. but headphone plugin and listen record, i cant hear background music (its too low). how can i do that? please help me. How do i record audio using auxillary. cable on ipad. I am using your code with iOS9. Now it is working fine if I record and stop and then play that file. 1. Start app and start record. 3. Now start app again. 5. It won’t play audio. Now if i stop recording from step 2 then it will play recording for next app run. So you have any solution for this? Is it possible to save the recorded data and store it in core data? would you make a tutorial about how how play music while capturing video ? Even though the article is from 2013….any chance I can still access the file? It’s showing 404….